The iControl full room heater is not your average space heater. The new Vornado iControl Digital Vortex Heat features a unique one-knob interface that puts all of the heaterâ€™s functions at your fingertips. A turn of the knob scrolls through the settings - Timer, Fan Speed, and Set Temp. Once you have made your selection, a simple push of the knob and the unit accepts your setting. A digital LCD screen clearly displays your options and the setting you selected. Vornadoâ€™s advanced automatic climate control eliminates annoying hot and cold cycles, maintaining the set temperature using less energy. 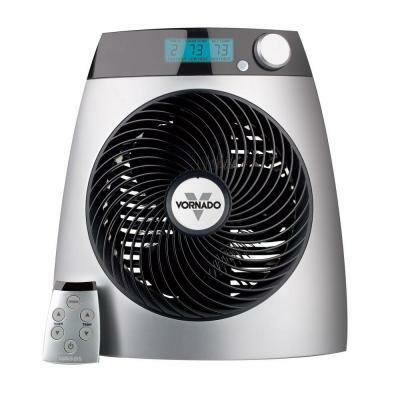 The iControl incorporates Vornadoâ€™s signature energy efficient Vortex Technology to fully circulate the warm air throughout the whole room, creating an even temperature. Unique one-knob interface puts all of the heaterâ€™s functions at your fingertips. Includes a remote control and multi-level safety protection with automatic tip-over protection, non-glowing heat element, cool touch cabinet, and tight grill spirals.